Leeraar wrote: CBS News says there is a "sell off" on Wall Street. My IPS says I must post a message in this thread when that occurs. Does your IPS command your messages to self-destruct when the market direction reverses? Relax, Santa Claus Rally is just around the corner !!! No, my IPS says I should waste time posting messages on Bogbleheads rather than tinkering with my investments. I see a crash in 08/09, a few bumps in the road in 10 and 11, but not much to write home about since then. I should include this provision in my IPS, so that I will never again feel guilty for wasting my time posting. Is there an award for reply of the year? cfs wrote: Dow down 99.99? Maybe the Santa Claus rally isn't real. Maybe it's just something our parents made up to make us want to hold stocks in December. ivyhedge wrote: Our shiba inu saw Bloomberg this morning and said, "much sell". I responded, "many buy". 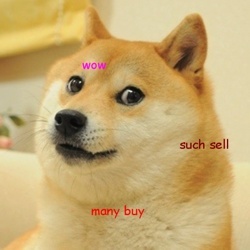 Gonna buy those stocks with dogecoin? What do all these people buy with ?! I have no liquid money to buy while supporting my family with my income. My investments are separate. Do they mean they are re-balancing and buying all these stocks with the Oil & Stock current crash or is it a downturn?? riptide wrote: What do all these people buy with ?! I have no liquid money to buy while supporting my family with my income. My investments are separate. Do they mean they are re-balancing and buying all these stocks with the Oil & Stock current crash or is it a downturn?? I keep a portion of my investments in really short term 0% bonds. They have pictures of famous people on them. Which people are we talking about here? People in general, posters on this forum, someone in a specific news article? I have plenty of liquid assets myself. They mostly compose of my EF and my next IRA contribution. I could time my IRA contribution if I feel the stock prices are artificially low, otherwise I can hold on to them to keep liquidity up until I'm ready to buy. I can also raid the EF, make a purchase and rebuild the EF later (it would have to be a huge crash and I'd have to be confident my job was secure). I won't really be ready to buy until I can officially do my taxes because I only want to put enough in my tIRA to get the savers credit, and the rest can go in a Roth IRA. It is real and it is just around the corner . . . this time Santa is moving slowly. cfs wrote: Maybe the Santa Claus rally isn't real. Maybe it's just something our parents made up to make us want to hold stocks in December. Last edited by Jfet on Tue Dec 16, 2014 4:28 pm, edited 1 time in total. Made a small buy in taxable account today. Could not resist. Money is there for Roth IRA after the new year, but just thought it might be better to make small buys in taxable before that. I am not asking Santa for much. All I want is for S&P to be above 2000. S&P2K has a nice ring to it. Why do we keep digging up this old dog? mickeyd wrote: Why do we keep digging up this old dog? Long threads strengthen the sense of community. Based on Wikipedia, Ariadne had a strong record in mazes and labyrinths. She's be a valuable contributor to this community. Well I do feel stronger, now that you mention it. I'm a stronger buyer of cheaper index funds. Gotta love it when dog food is on sale! - what's up with stocks going down. Santa Claus is just around the corner and probably going to give well-behaved buy-and-hold folks sweet gifts. Because pre-cortex area needs support to suppress the amygdala. Because our brains are wired to archive painful perception longer than pleasant one. Simple, for the vast majority of investors their true risk tolerance is lower than their need for risk. Personally I'd really prefer if the maximum downside on my portfolio was about 10%, but there is no way I'm going to achieve my goals with 80% bonds. At current valuation levels, a prudent strategy would be to adopt a conservative AA and plan to save more to compensate. The immortality of this thread is testament to the anxiety about stocks. Sell some stocks, sleep better. How come we didn't have a thread this year called "Interest rates in freefall"? Browser wrote: At current valuation levels, a prudent strategy would be to adopt a conservative AA and plan to save more to compensate. The immortality of this thread is testament to the anxiety about stocks. Sell some stocks, sleep better. I found I had just as good a chance getting out of her maze of conversation by taking a random walk as I did planning my responses. The St. Nick rally has begun. S&P 500 up 2.23% today. CoAndy wrote: The St. Nick rally has begun. S&P 500 up 2.23% today. Good day in the markets . . . for a change. [OT comment removed by admin LadyGeek] But for now, the shorts had to cover and we have a little candycane rally. But tomorrow? My 457 contribution goes through tomorrow, so hopefully it drops back down! Please stay on topic, which is tracking the US stock market. Comments related to the recent meeting of the US Fed are off-topic (political). What if this guy shows up instead of Santa? Browser wrote: What if this guy shows up instead of Santa? Well, Shipmate Browser, Santa is just warming up . . . the big guy is about to sing. Boing! I missed the bottom again, just as I was about to do my Roth contribution for this year. Ho! Ho! Ho! Just make sure to keep your return receipt in case what he leaves turns out to be a dud later. No one noticed that the Swiss have adopted a negative interest rate to keep out the rabble rouble. Down 300 tomorrow because of "European currency concerns"? Leeraar wrote: No one noticed that the Swiss have adopted a negative interest rate to keep out the rabble rouble. Down 300 tomorrow because of "European currency concerns"? Good point by shipmate Leerar, and as I understand (from reading BBC news early today) this takes effect in mid January 2015 affecting large banks and companies. Oh by the way, negative rate means you pay the bank to deposit your money, isn't that nice? chaz wrote: No freefall today. It will not be a happy Christmas if S&P 500 is not at all time high at the end of the year. NASDAQ certainly has been cray-cray the last couple of years. Coming back close to where it was just before the tech wreck. I'm getting flashbacks.